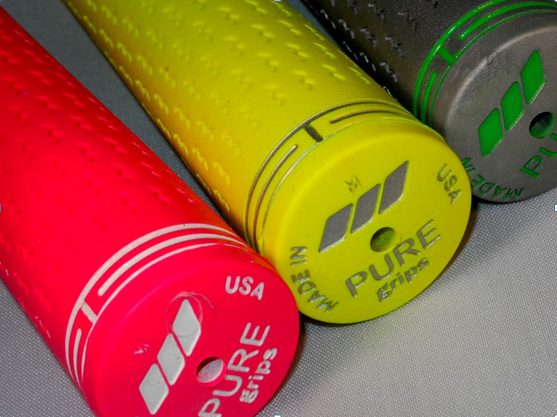 PURE Grips has evolved quickly since their initial foray into the golf industry a few years ago. 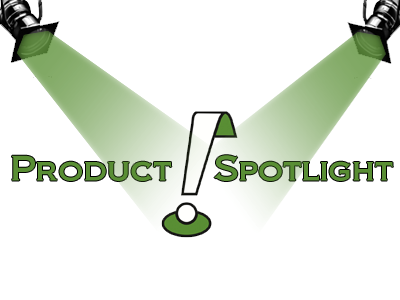 Initially offering just a small selection of surface designs and color options, they now have a variety of different choices available, ranging from the most basic up to custom designs. 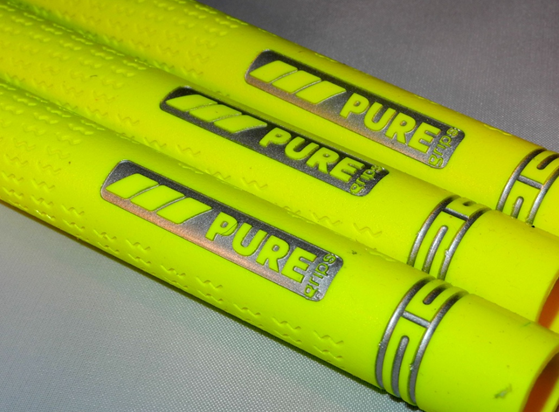 Now available online, their latest version of the Pure Pro grip features three bold neon color combos. 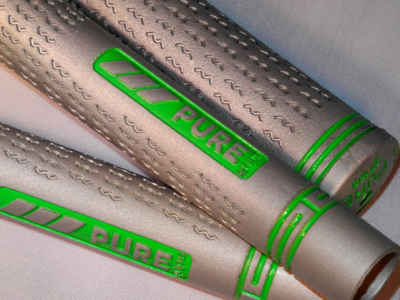 Those familiar with the PURE brand won’t need a primer on the company, but for those that aren’t – PURE Grips are just a little different than the rest. Rather than the standard installation method using tape and solvent, PURE Grips are designed to be installed tapeless and with air pressure. They sell a small ‘gun’ that attaches to an air compressor, though other attachments will work as well. The benefit of the PURE concept is making simpler and quicker a project that can be a bit messy and time consuming. The special edition PURE Neon grips are available only in the Pro version, which is probably the most well-rounded grip in the company’s lineup. Slightly firm and textured, void of harsh surface patterns, and tacky to the touch, the Pro is easy to get along with, though its performance does suffer at times in humid or wet weather compared to others. A wet towel is a great way to bring them back mid-round. The three color combos offered in the neon edition are pink/white, silver/green, and yellow/silver and all three offered in each size that the PURE Pro comes in (undersize, standard, and midsize). They are currently available through online retailers, priced as low as $5.50 per grip. Great looking grips. Did not realize these were installed without tape. May have to give these a try. Thanks Hawk. Thanks for the spotlight here Hawk! I need to look closer at these as I’m a fan of Pure grips and a fan of color so these may need a spot on some clubs. Love the gray with green. I have never tried the grips other than the putter grips which I am not a fan of. If you had to compare them feel wise to something in the GP or Lamkin line, what would you say? I like that they now offer some different combinations. The silver grip looks pretty sweet. They are the easiest grip ever to install. OK, the silver ones are pretty badass. Thanks Hawkster. Those silver and green might have to go on pretty soon. Maybe throw the pink on the wedges. The 3Gen I have on now are no bueno with the heat and sweat. 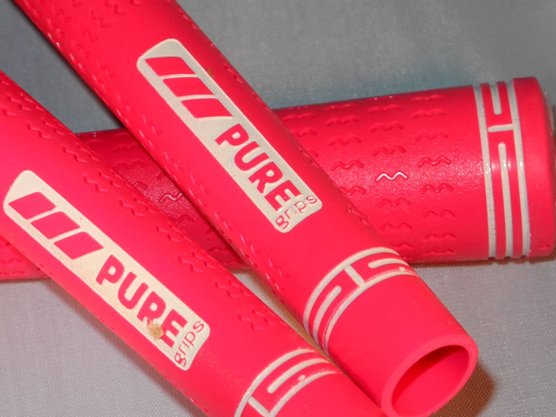 PURE definitely makes the best grips. Every time I get a new club the first thing I do is cut off the current grip and install a PURE Pro. Love seeing more color options for an all around good grip. I think color and style are starting to bleed over into clubs and offering more options will help grip companies differentiate them from the competition. Rank backlinks to rank in top ten. I know – buying them is too expensive.